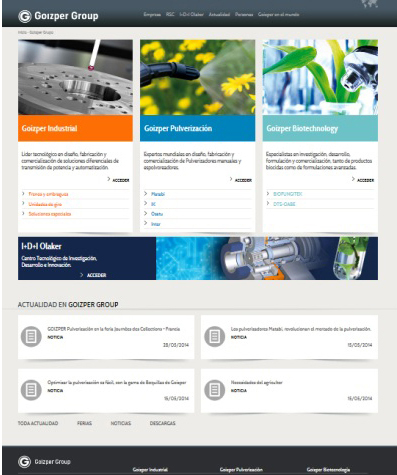 GOIZPER GROUP launches its new website www.goizper.com, an updated space with the new corporate image and restyling of all its business brands. This new space offers users a modern, more visual, interactive and communicative design, which contributes to consolidating the company brand and intensifying the knowledge of its activitiies and direct contact with the market. - Goizper Biotechnology (specialist in biocide products). facilitating the information search in agreement with each user profile. Updated content will be offered, as well as a picture gallery, videos, etc. The new website is optimised both for computer and for mobile devices. The objective is to continue to adapt to the information needs and maintain interactive communication with the customer and end user.